I'm a jam maker myself, so I'm very particular about my jams. I don't like them overly sweet. I don't like them too gloppy or too thin. The Jam Stand hits all the right notes with this unusual combo. 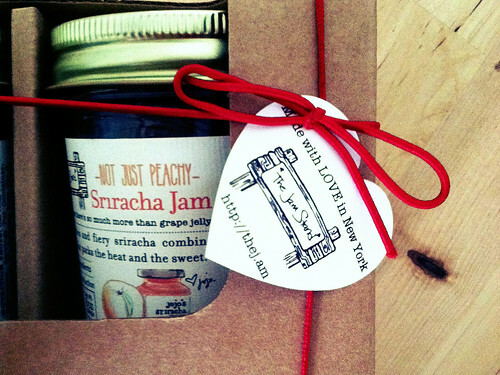 It's sweet and Jojo's Sriracha lends a more than just a little heat. And those peaches? They aren't pureed beyond recognition...there are sizeable peach pieces. Win. Believe me when I tell you that this is my new jam obsession. What do you put it on? Anything, my dears, anything. But my favorite pairing thus far has been using this jam as a sandwich condiment with leftover Mighty Quinn's brisket. That's one meaty, spicy, smokey sandwich.